The 'veggie' wrap which turned out to be chicken. The customer, a devout Hindu from Preston, took several bites before realising the mistake and spat it out. “I was physically sick - I’ve never eaten meat in my life before,” said Mr Parekh, who didn’t want his full name to be published. Mr Parekh ordered two “veggie” wraps, salad and milkshakes via the app Uber Eats from the McDonald’s restaurant at Deepdale Retail Park. When the food arrived he started to eat his wrap and didn’t realise it was actually chicken until he had already swallowed several mouthfuls. “It was quite a shocking experience,” he told the Post. “I’m a true vegetarian. It’s a religious obligation that meat is not allowed. I don’t even eat eggs. I’m very strict about it. “When the food came it had ‘veggie wrap’ on the packet and so I started to eat it. After a few bites I realised something was wrong and I spat it out. It was then that my wife and me noticed it was really chicken. “I was shocked and upset. So I phoned McDonald’s straight away to complain. I got a refund and an apology. “I decided to make this public because I don’t want anyone else to go through what I’ve gone through. 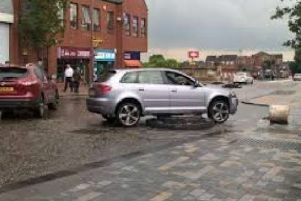 Nigel Dunnington, boss of H&S Restaurants which has the McDonald’s franchise in Deepdale,said: “I’d like to apologise to Mr Parekh for the distress this mistake has caused. “We absolutely recognise that it’s not acceptable to serve meat when our vegetarian product has been ordered.